. : Optics & Photonics Focus :: Refractive Index: To the Limits and Beyond :. The core of high refraction. The picture displays the core of the metamaterial with high index of refraction proposed by the researchers at Stanford University. Both high electric permittivity and magnetic permeability are needed in order to achieve a high refractive index in a metamaterial. Metallic inclusions allowing electric charge migration give a high permittivity, but usually a small permeability because of electric currents. The shape of the metallic inclusion needs to, therefore, be optimized in order to allow electric charges to move in non-loopy paths alone. There are limits to everything; limits imposed by the laws of Nature. Many limits can be surpassed, however, and mankind has made a point of getting around them to our advantage. Metamaterials, for example, are materials of human creation with properties non-existent in known natural materials . The refractive index is one of those properties that is difficult to modify at will. Researches at Standford University (California, USA) have proposed a new approach which will help engineer materials with arbitrarily high refractive indexes and, therefore, with potentially revolutionary applications. Nothing can go faster than light! In a medium, however, the speed of light and of other electromagnetic waves is reduced due to the interaction between light and atoms. Such reduction in speed is measured by the refractive index of the medium itself. The common glass, for example, has a refractive index of around 1.5. This means that the light in vacuum is 1.5 times faster than in glass. If we want to slow light down even more, we have to look for materials with a higher index of refraction than glass, such as diamonds, which have a refractive index of around 2.4. Does a better material exist? Unfortunately, not in nature. However, a suitable material could be engineered ad hoc. A metamaterial indeed! Just like modern alchemists, we can combine two materials in such a way that light, or another electromagnetic wave, propagates as it would in a single material — at least at a macroscopic level. Why should we want such an unnatural composite? The reason is that such material can feature electromagnetic properties different from those of the constituting materials, even exotic properties that no known natural material displays. The trick is to make the fundamental units of the metamaterials much smaller than the wavelength of the propagating wave. In this limit, light will not notice the fundamental units, but it will somehow average them out. Not convinced? Just think of an ordinary material — let’s say iron. We can identify it univocally on the basis of its chemical and physical properties. What would happen if we took a block of iron and started splitting it over and over again? Eventually we would get to a single fundamental unit of iron – an iron atom – that would still have the same properties of the original block. One step more? We would decompose the atom into protons and neutrons and electrons with totally different properties from the iron atom. The same happens in metamaterial. The only differences are that the fundamental unit is larger than an atom, made of different natural materials instead of electrons, protons and neutrons, and that it has been engineered by scientists to have the desired electromagnetic properties. "To achieve a high refractive index, we need high permittivity and permeability at the same time," explains Shanui Fan, leading the research activities at Stanford University, "because the refractive index is the square root of the product of the electric permittivity and the magnetic permeability of a material. A high permittivity can be easily obtained by metallic inclusions which allow electric charges to migrate. However, having metals typically results in a small permeability, because electric currents are induced on the metal surface to oppose the applied time-varying magnetic fields. We need, therefore, to find an appropriate shape of the metallic inclusion that allows the electric charges to move in non-loopy paths alone." The new theoretical proposal from Stanford researchers is a cubic geometry, where the six faces are connected by three orthogonal metal wires intersecting at the center of the unit cell. In every plate, moreover, air slits can subsequently be introduced in order to minimize any loopy circulation of charges. Such unit, embedded in a proper hosting medium, led to an effective refractive index of between 5.5 and 7 on a broad range of wavelengths in the intermediate infrared, from 3 to 6 micrometers. Even though the proposal is still on a theoretical level, Nader Engheta at the University of Pennsylvania (USA) envisions "exciting applications for such media," when the fabrication technology will be advanced enough. "One class of applications," he adds, "would be the miniaturization of devices and components. In a medium, the effective wavelength is shrunk by a factor proportional to the refractive index: the higher the refractive index, the smaller the structures. Moreover, to slow light over a broadband, as a consequence of a high refractive index, could lead to delay lines, optical buffers and data storage applications." Fan adds that "subwavelength imaging and lithography could also benefit from an increased index. Another application could be to enhance the sensitivity of interferometers. The fact that one can realize a wide range of indices can be used, moreover, in such systems as invisibility cloaks." When are these applications likely to come about? 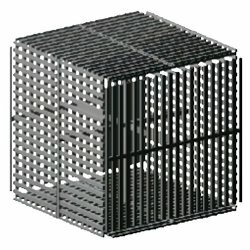 Are the fabrication techniques we have today advanced enough to build such metamaterials? "It depends on the wavelength of interest," Fan answers. "The design principle works in a very wide range of wavelengths. For microwaves, the structure could be fairly easily constructed with copper patterns on insulating substrates and connecting rods. We believe the terahertz regime can also be reached with current semiconductor fabrication techniques. The infrared or optical wavelength demonstration is tricky as the required minimum size of the feature reduces when the wavelength decreases, but we are also looking into some novel fabrication techniques. A high index metamaterial that works in the optical regime is certainly of extreme interest. In such regime, metals behave rather differently than they do at lower frequencies and they have large optical losses. There are, however, no fundamental obstacles to prevent the existence of such wonderful metamaterials, and some ingenious designs and new non-metal materials will go a long way towards their realization." D. R. Smith, J. B. Pendry, and M. C. K. Wiltshire, Metamaterials and Negative Refractive Index, Science 305, 788-792 (2004). Jonghwa Shin, Jung-Tsung Shen, and Shanhui Fan, Three-Dimensional Metamaterials with an Ultrahigh Effective Refractive Index over a Broad Bandwidth, Physical Review Letters (2009) 102, 093903 (link).